Below is a narrative of the history of Mzimba district in Malawi as narrated by Reverend Dr Overtoun Mazunda at the Centenary Celebrations of the establishment of Mzimba district in 2008 at the foot of Hora Mountain in Mzimba district in Malawi. 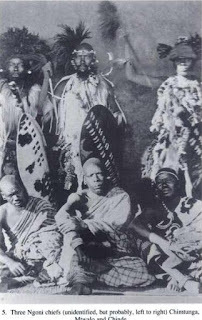 This is probably one of the few pictures of Inkosi yamakhosi Chimtunga called Chimtunga (knobkerry) by his Chewa subjects. From left to right seated are Chimtunga, then Mtwalo and Chindi. As pointed out in the history narrative above, Inkosi Chimtunga was deposed by the British in 1915 for resisting efforts by the British to recruit Mzimba people to join the British Army during the First World War. Bayethe Amakhosi.